Now I don't want to sound like a Tory, God forbid, but what the hell is wrong with people these days? I happened to need to buy a couple of greetings cards on Sunday morning and as we needed some shopping, I thought I'd pick them up in the big 24 hour ASDA in Govan. This is a huge supermarket so stocks everything you can dream of. The cards aisle is away off to one side and fairly secluded. I was standing looking through the birthday cards for my good friend Sheina who turns 40 on Friday, and through the condolences cards as I had just heard the day before that an old friend of mum and dad's had died after a 3 year struggle with diabetes. When you are looking at condolence cards, you are not in the mood to be pissed off by juvenile delinquents. The card aisle stocked everything for birthdays - candles, banners, cans of that spray string and party poppers. Three boys, maybe 12 or 13 years old ran into the aisle, picked up the spray string cans, opened them and started running around spraying them over each other, laughing and knocking things over. I was outraged. The other 2 or 3 customers simply crept away pretending not to notice. What is wrong with these people? They are as bad as the kids' parents who were nowhere in sight and letting them wreck the shop. I turned to them and suggested they paid for the goods they were destroying and got back a cheeky - 'We're rebels Mrs' from the 3 larger-than-me youths. I pointed out they were not rebels but 'both infantile and destructive'. When asked what that meant, I shook my head. I didn't see why these little toe rags should be allowed to continue though so left the aisle. They must have assumed I was slinking off like the other customers, so went back to their nonsense. This meant they were less than pleased when I returned 2 minutes later with both the customer services guys and the cleaner. I left as they were being handed a brush and pan to clear up their mess. But you have to ask - where were the parents? 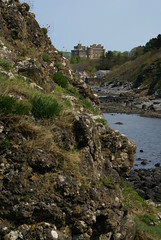 Culzean has to be one of my favourite places to go for a day out. Especially at this time of the year when all the bluebells are in bloom on the cliffs and in the woods. Yesterday Thomas and I spent a lovely 5 hours walking along the rocks from the castle to Port Carrick, then over the cliffs and round the Swan pond, stopping occasionally for a picnic or a seat. It was nice to spend some quiet time together for once. Afterwards we'd to rush back up the road to Glasgow to lend Derek my car as it has the largest capacity in the family and he had some beds and stuff to take to the dump. We stayed there and had a lovely curry and family evening. I hope Derek, Amanda, Mum and Dad enjoyed it as much as Thomas and I did. Léon was full of mischief tonight as he mixed pesto, pasta and chocolate mousse for dinner and ate them with glee. As I watch him some nights, I believe that babies must have different taste buds to adults. Some of what he eats is truly revolting but doesn't seem to bother him in the slightest. Léon got several Easter eggs, one of which Auntie Amanda dropped off last week. I threw it in the car and have been meaning to bring it into the house for about 4 days now. Even today at lunchtime I noticed it sitting beautifully oval in its packaging on the back shelf of my car. At 3pm I noticed the outside temperature was reading 16 degrees and decided I really ought to bring it in today before it melted...oops, too late - so it is in the fridge now solidifying - I guess Pudge is too wee to complain and chocolate tastes like chocolate whatever shape it is when you are 19 months old. Millers have finally published the mosaic on the net - you have to click on mosaic, view final mosaic and zoom in to full magnification and then you can check it out properly by dragging the little yellow box around with your cursor. When you do you get a good look at all the photos used to make up the final poster, I counted around 50 of my photos, 3 of dad's, 2 of Derek's and 2 of Thomas's so I guess between us we made up most of the mosaic single-handedly - who needs a prize, huh? Today is definitely not one Léon will note down in his diary amongst his top ten fun days. It started at 9-30am when I had to apply anaesthetic cream to the backs of both his hands and the inside of both his elbows and cover the cream with clingfilm stuff. He was heart broken - every time he looked at his little hands he burst into big sobs and eventually ended up pulling one of the patches off. At that point we decided a long-sleeved jumper was probably the only way to keep the cream on long enough to anaesthetise his little veins. 90 minutes later it was off to the hospital where they injected him with radioactive liquid and told us as he screamed the place down that it was probably best we tried to hug the wee man as little as possible for the next 24 hours till the Chernobyl effect wore off, wee man... Finally we'd to go back around 1pm when they strapped him into this dreadful machine using a foam and vecro strait jacket and took 2 photos each taking 15 minutes to expose. The first was worst as that was of the kidneys from above so Pudge was sandwiched in and panicking and screaming - enough to make any mother just want to punch the doctor and rescue her wee man, and for the other they rotated the camera to beneath him - slightly less scary but he was already so freaked out, there was no calming him. Of course 2 minutes after he was freed from his vecro prison, he was back to his calm, happy self - though he fell asleep, utterly emotionally exhausted, as the car left the hospital carpark. I now have to wait 3 to 4 weeks for them to no doubt tell me what I have always expected and that is that the mystery virus from last October did not damage his kidneys - fingers crossed anyway. Are you ever really puzzled by something you see when you are out and about? The other day I was walking from Garnethill to the park to see Derek and Amanda and I passed this. 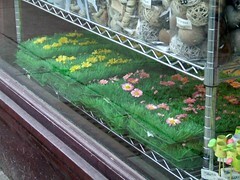 Smallish 70cm square chunks of plastic grass with plastic flowers growing on it, for sale in a shop window. I hate plastic flowers more than most things but at least I can see that if you are a lazy git you might like to put them in a vase and display them tackily somewhere in your house, but plastic squares of lawn? Are you meant to buy a whole lawn's worth and stick them outside nailed to your front garden, or leave them lying decoratively somewhere in your house or what? What exactly are you meant to do with plastic lawn squares? Isn't this such a sweet photo? 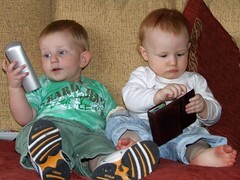 Oh look Léon, I found my dad's credit cards! Cool, I'll ring for pizzas - what do you fancy - cheese and tomato? Extra mushrooms? 5pm can be a fairly stressful time of the day. Three tired kids want to eat. 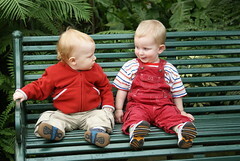 The two big ones react by niggling at each other and winding each other up. They both want to sit on the same chair, neither accepts the other's choice of TV show, etc. The little one reacts by following around at your feet, his two arms sticking straight up in a 'lift me now' gesture while he whines just annoyingly in the background. I decided the other evening that toast would serve the purpose of getting them all off my back long enough to allow me to cook. I made 3 slices, took out a brand new unopened half pound of butter and spread them each a slice and went back to cooking. Silence and happiness from the next room at last. But after quarter of an hour it suddenly struck me - they were too silent. I went through and found Marcel and Charlotte watching the Simpsons happily on the couch but Pudge was still at the table - toast untouched, but silent and happy as he ate his way through handfuls of butter. He had consumed just less than half of the butter. And worse still there were little Pudgy hand prints all over my dry-clean-only green jacket that I had hung over the back of the dining room chair. I guess I know how to keep him quiet though at least! Finally the night of the big photo competition arrived. I ran the olds into town, then went home to pick up Thomas. Already things went a bit wrong. The 5 minute drive to the venue, with 15 minutes to spare started to look a bit tight when some idiot broke down in the middle of Great Western road and simply decided that abandoning his car in the middle of the road was an okay option. So as Thomas frantically texted mum with the news that we would be late, I fought my way through traffic to the West End. The soirée was being held in the Oran Mor - the old church on the corner of Byres road that has been converted into a bar. On arrival the bouncers told us that if we were here for the photo competition, we'd to go in the side entrance. No problems... We rushed round to the side, flew up the stairs and burst into a rather sedate room, filled with pensioners - weird... an old man came up and asked if we had known the deceased - oops! gatecrashed a funeral - back downstairs we found the other side entrance, leading down, not up a flight of stairs, phew! 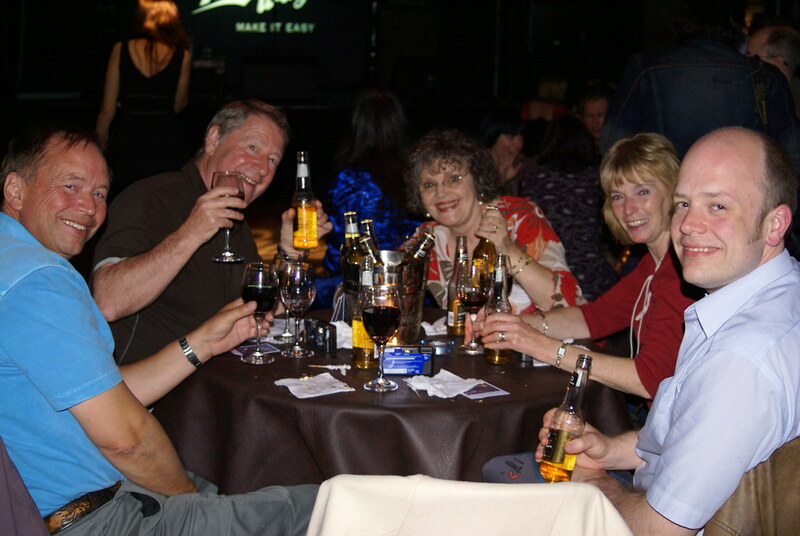 Mum and Dad had recruited Steve and Joyce to come as spare guests - figuring they might be somewhat interested in an open bar. The 4 had managed to get in without me to sign them in and had found us a wee table and about 320 free bottles of beer. Everyone else in the room was between 18 and 25 with messy chewed-up hair and funky clothing. After much faffing and munching on canapés (2 hours of faffing to be precise), followed by a very loud wee singing girl (Amy MacDonald somebody), some teuchter bloke got up and made a speech about this wonderful university competition. University competition? He announced that all of Glasgow's students had put their heart and soul into the competition and the overall winner would receive the much-deserved £500 worth of photographic equipment for their place of study! Huh? This was truly bizarre - I reread the web page today. Nowhere does it mention universities or students. It simply says: We are going to wrap a key building in Glasgow with an iconic image celebrating your city. The iconic image will be created from a mosaic of photos, taken by you the people of Glasgow. This is our invite to you to get involved and be part of this unique work of art. No students mentioned, no prizes mentioned. And because it was being run by an alcohol company you had to give your date of birth to enter, though not your place of study. So it seems that Dad and I had made it through to a final that we were ineligible to win, given we couldn't give the prize money to our place of study. The press had even done an interview with dad so they knew for sure he wasn't a student! Weird. Anyway, needless to say we didn't win. I thought Mum, Dad, Joyce and Steve would be disappointed but after 5 hours of free beer, they rolled down to the train station, their pockets and handbags filled with more free beer and seemed less than disappointed with the competition result. Dad has now emailed the jury to ask why 2 ineligible finalists were put forward to the judges, though thanking them profusely for the free alcohol. So if he finds out what exactly it was all about I will enlighten you. Oh and for the record, the winning photo was a portrait of 5 or 6 students smiling into a camera. They looked happy enough, but iconic image of Glasgow? Huh? 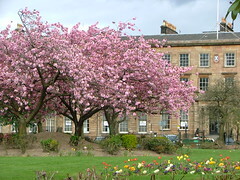 This photo said smiling students to me, not Glasgow - they could have been from anywhere in the Western world. I guess I must be getting old, I just don't get it. Isn't this so sweet? 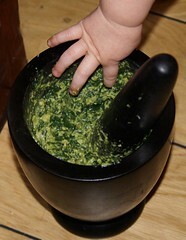 My wee bitsy man watched Thomas make homemade pesto, then decided to stick his wee pudgy fingers in and have a taste. He decided it was so good, he had a whole plateful with spaghetti. 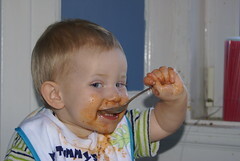 Charlotte, of course, had one spoonful and announced she wouldn't be having 'barf sauce' on her pasta! JUST WHEN YOU ARE BEGINNING TO THINK YOUR OLDEST KID IS FAIRLY GROWN-UP AND SENSIBLE! Unfortunately the full horror of what he's done isn't quite visible on this photo. I must try taking another in the daylight. It started at bedtime. Charlotte went to the bathroom to brush her teeth. 'Who's shaved?' she shouted. Bizarre question I thought, given she and I don't shave, Marcel and Léon are too young and to my knowledge Thomas doesn't know what a razor is on a Saturday or Sunday. So that ruled out everyone in the house. 'The sink is full of hair' she elaborated. Marcel then appeared in the doorway - his hair approximately 3-4cm all over, except around his fringe where it had mysteriously shrunk to 0.5cm. 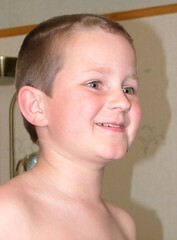 'Mum, can I maybe go to the hairdresser's this week' he asked nonchalantly. Normally I have to drag him to the hairdresser moaning his face off so asking is unheard of. I immediately noticed what it was he wanted correcting and asked for an explanation. 'Well it was getting too long and tickling my eyebrows so I cut it with some scissors', he told me, ' but I am too short to see in the bathroom mirror so I just cut it without looking!' Give me strength! Cutting it even if he could see would have been crazy but blindly? Oh well... I guess his school mates' laughter tomorrow might be enough to stop any recurrence in the future of this folly. A few weeks ago my beloved hp Pavilion - you know the one whose DC socket was fixed in November, December, January and February - developed two new faults! It started overheating, the fan would come on, it would tell me it had reached critical temperature and it would shut itself down automatically usually between 30 seconds and 5 minutes after I turned it on! Then the on-off switch started only working every 10th attempt. 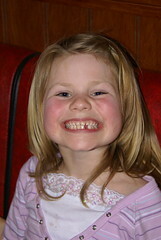 I probably didn't blog it at the time for fear of my children being exposed to a rather long list of expletives! Anyway - the diagnosis was another £140 bill, on top of the £70 the DC socket had cost. I didn't trust them to fix it again, nor did I fancy them having it on and off for 4 months until it finally worked again, so I bit the bullet and ordered a nice new Lenovo laptop complete with windows VISTA. I have spent the last week installing most of my stuff on it - which wasn't fun - as the old computer only stays on 5 minutes at a time before switching itself off, backing up my whole system in 5 minute chunks was fairly tedious. Fortunately I had backed up most stuff in January so it was feasible. I am now very happy with my new acquisition - hopefully it will not give me reason to blog-rant in the near future at least. I'm not quite sure how I got talked into it but just 3 days after my hopeless wild goose chase round Fife, when I vowed never to return without satnav, I got talked into another day out in that neck of the woods. Considering I have only been to Fife about 8 times in my life, twice in 3 days was pushing it. This was, however, a much less stressful experience - we 'multimapped' and printed out a list of places to visit and as the weather was beautiful, it was the perfect choice. First stop was Culross (pronounced weirdly 'Cooriss' or something similar - (don't you just love Scottish - Milngavie, Strathaven and all the rest?) What an astoundingly beautiful little place (see my photos on flickr) - I felt like I was somewhere in France or the likes, not Fife with all the pretty coloured buildings - though I guess the natives are fairly short, as Thomas had a bit of a problem! 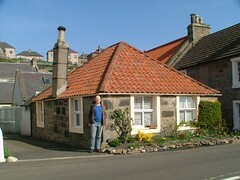 Then we saw Crail - a pretty fishing village - though more Scottish. And finally we stopped in Anstruther - a place which patently has the best fish and chips on the planet - though we decided to forgo the 2 hour wait and simply bought our supper at Mearns Cross on our return. Mummy, what's daddy doing to you? 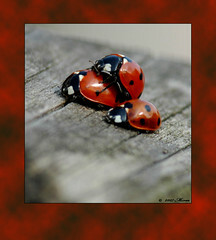 I came across this - they aren't shy, are they, these bugs ;-) I particularly like title the photographer chose for it. Until today I thought that satnav was for stupid and/or rich people! I mean, why on earth would anyone pay 1 to 5 hundred pounds for something that tells you where you are and where to go when there are road signs everywhere anyway? I have driven since I was 17, all over Europe - lefthand drives, righthand drive, manual, automatic, I've taken buses in the States - believe me - there are road signs EVERYWHERE...except Fife! Now I know why satnav was invented - it was invented for any poor bugger who even attempts to visit Fife! This morning I took a quick glance at a map, saw my route was Falkirk, North Queensferry and figured - piece of cake - 45 mins tops. 90 minutes later and after 4 trips through the centre of effing Falkirk I was so in despair I got Marcel to text Derek at work and ask him for directions! You see once you get to Falkirk there are no sign posts for anywhere in Fife - not Kircaldy, N Queensferry - nowhere - just Glasgow or Edinburgh or Grangemouth - and I knew I didn't want those! Grudgingly, I ended up going from Falkirk to Edinburgh and crossing the flaming Forth road bridge though knowing that was an utterly stupid route. At least the way back would be easy - I mean Glasgow is a big place so would be signposted, surely??? Nope. From North Queensferry there are no signs for Dunfermline 5 miles away, from there, none for Glasgow though plenty for Rosyth and Kircaldy - you see once you are ensnared in the trap that is Fife, they don't let you out again! Fife is obviously for Fifers and people with satnav - they do nothing to make it easy to get there and nothing to help you escape either. I am glad to report we made it home safely - eventually. 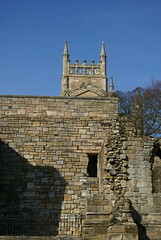 And I won't be rushing back (not till I buy satnav anyway) though Dunfermline and North Queensferry were very pretty. Strange things happen over pizza! Two observations about the tooth incident yesterday. HIYA GORDY, FANCY MEETING YOU HERE! Hiya Gordy! fancy meeting you here! It really is a very small world some times. For only the second time in 3 years I decided to go to Calderglen country park in East Kilbride. As Marcel was at Sam's birthday party, we couldn't go until 2pm, so arrived around 2-15pm. On approach, I could see the beautiful weather had drawn a bigger crowd than usual as the overflow car park was in use and cars were lined up in their hundreds. Imagine our shock as we got out the car and immediately walked into not only Derek, Amanda and Gordy but also my parents. My parents who haven't been near Calderglen since last July and Derek and Amanda who have never been at all! What are the chances of us all arriving in the same park - 10 miles from all our houses unarranged at exactly the same time, especially given there are dozens of parks closer to all our homes. My kids were, needless to say ecstatic at the discovery of this unexpected company, though I'm not sure the others were as thrilled. Given my parents see more than enough of my kids at the best of times and Derek and Amanda had had all 3 overnight for the first time ever just 2 days ago - they had all probably sneaked out to East Kilbride assuming it was a fairly safe Gautier-free zone! Haha - got you! Nowhere's safe!